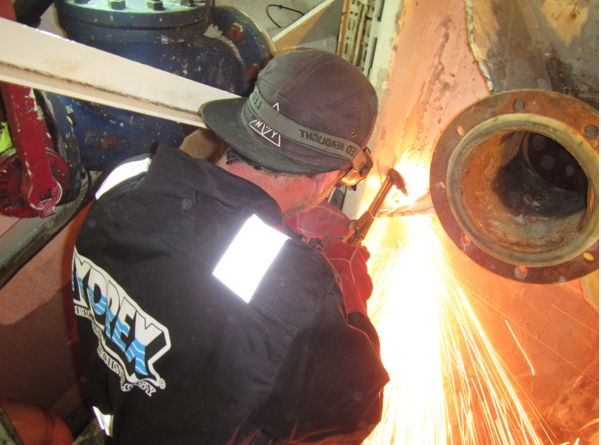 Diver/technicians from Hydrex carried out a pipe repair on a 238-meter cruise ship during her stop in Punta Del Este, Uruguay. The vessel was suffering a leak as a result of corrosion damage to the pipe and a swift on-site solution was suggested by the company’s technical department. The repairs were performed afloat with the Hydrex cofferdam technique. This gave the owner a cost effective alternative for drydock. An overboard pipe needed to be replaced on port side. This would stop the water ingress and secure the integrity of the hull. While preparations for the welding work were ongoing inside the engine room a mobdock was installed and secured underwater over the outlet of the damaged pipe. The Hydrex team then disconnected the old overboard pipe and the surrounding support frames. The hull plating and the new pipe were then prepared for fitting. Once the pipe was positioned, welding of the hot pass was done according to the Hydrex class approved welding procedures. This connected the overboard pipe to the ship’s hull. The support frames were then reinstalled and the remaining piping and valve were reconnected. An ultrasonic test was carried out by independent testers. This showed that the repairs had been performed successfully. The cofferdam could then be removed. Finally a visual inspection was made on the outside by the Hydrex team. The repair was approved by the representative of the classification society who had been present during the operation. Overboard pipe repairs are vital for a vessel because there is a direct connection between the outside hull and the pipes. This means that any damage to these can compromise the integrity of the hull. For this reason the classification society will very strictly monitor their condition and will demand a fast and thorough repair of the damage. If this occurs Hydrex can offer a permanent afloat solution. Their teams bring a high standard of care and professionalism to any operation to guarantee that a ship can sail safely afterwards. Due to the nature of the ship, only a limited time frame was available during each stop. The Hydrex technical department therefore looked at the schedule of the ship to find the best opportunity to perform the operation. The divers made sure that the service was delivered in as short a time period as possible so that the ship could leave Punta Del Este on schedule.